This shake is as potent and delicious as health-giving shakes go…and the intensity of the vibrant green color of it underscores its nutritive value. It can be made to the consistency of soft serve (how I love it,) or as liquid-y as you prefer! Or, you might want to add more Tocos and ice in a power blender like the Vitamix, put it in the freezer for 30 minutes or so and then scoop it out and add some toppings for a real good-for-you dessert. I crave this like crazy, so I have it at least every other day as I developed it to meet my detoxing, nutrifying, cytotoxic needs as part of a overall get whole and healed lifestyle. Adjust it to your liking and amp up the greens in it as you can tolerate and enjoy! SEE THE “ICE CREAM” VARIATION OF IT IN PHOTOS BELOW! Simply blend it all up and make as thick or thin as you would most delight in and sit to enjoy the ultra healing you’re ingesting. No kidding that it helped me detox from metal toxicity quickly, kept my cravings at bay, kept me satisfied for hours, and gave me a vast spectrum of minerals, protein, and vitamins I needed to recovery from many a health compromise over many years. I must warn you… once you get this down to where you like it, you might get hooked! It’s fun to top this with chlorophyll or E3 as I recently did to make this post with hemp and coconut shreds, but do as you please! Much health and joy to you! p.s. my other two shake/smoothies in rotation are called Hi-C-me, Cacao-Mente, and Avo-matcha… those will be posted and shared soon, too. AND NOW, TO MAKE IT A REAL TREAT FOR YOU AND MAYBE SOMEONE SKEPTICAL ABOUT HOW GREAT AN EXPERIENCE GOOD FOOD CAN BE…MAKE IT INTO SUPERFOOD “ICE CREAM”~ (just put in freezer 30-40 minutes, scoop it out, garnish in a hurry, and serve it up! and one more before devouring! ENJOY yours! Read the notes tied to each image for more information and perspective. Ingredients are awesome and if you have this, there is no need to have additional sweetening, in my opinion. This is essential for the creamy, soft-serve-like texture that offers wonderful mouth-feel to the shake. But, not mandatory. 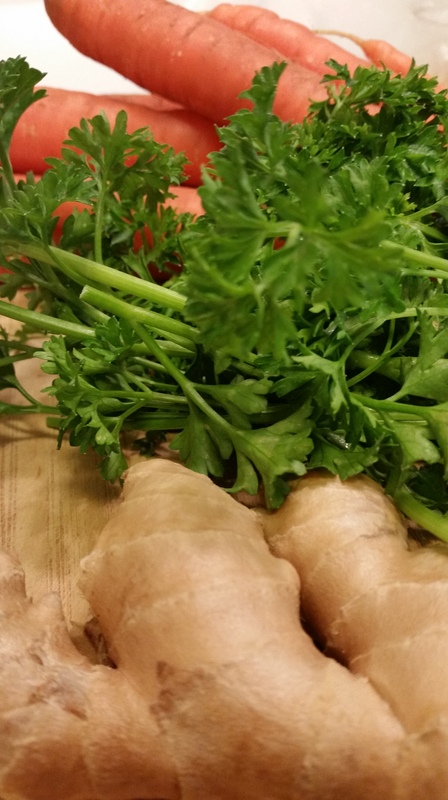 So, what do you get when your visit to the farmer’s market yields carrots, ginger, apples, and a huge bunch of parsley? blend it up in your VitaMix! …along with a bit of frozen mango chunks, pre-frozen cubes of pumpkin puree, unsweetened vanilla almond milk, and enjoy the FALL HARVEST refresher! 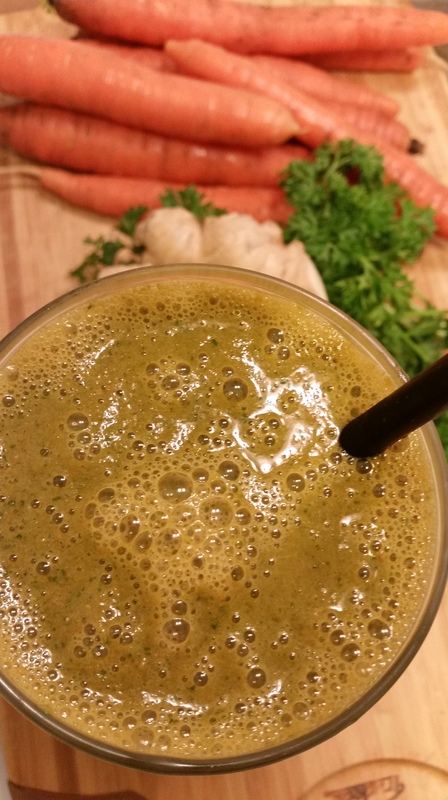 The key taste in this gently sweet concoction is the blend of pumpkin, carrot, and parsley with ginger. optional: cinnamon, dates, & banana (too much banana may dominate the veggie/pumpkin overture in this drink). if you want added Vitamin C, throw a wedge of ripe red bell pepper in for a subtle undercurrent of flavor to complement the ginger. note: The more pumpkin you add, the creamier; if you want it sweeter and creamier, add bananas and dates and cinnamon to highlight up the pumpkin-ness of this season. Bit of ice blended in is always nice.